My name is Bayla. I'm a cat. I was born in 1994 near Chicago, Illinois. My human got me on the same day she was moving to a new house, and I had to spend the day in an empty fish tank. Fun. In 1998, we moved to California. That was my first experience with a long-distance road trip, and I was glad it only lasted a few days. There wasn't anywhere dark and cozy to hide inside our cage, and it's hard to nap when everything is noisy and shaking. In 2008, we moved again, and this time the road trip lasted five months. 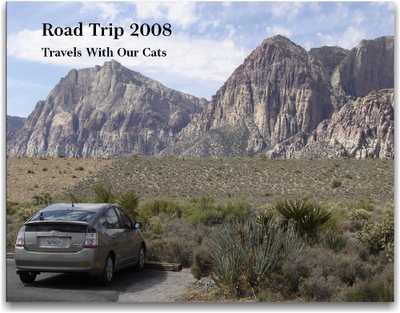 I know what you're thinking: How could any self-respecting feline spend all that time on the road? I got used to it. We made plenty of stops. The humans brought a lot of my stuff, and there was always a bed for me to hide under. We drove all around the United States, to lots of different places with many interesting smells. Still, five months was my limit, and I pointed this out to the humans by puking in the car. They got the message and settled down in Vancouver, Washington. But the humans still traveled by themselves, and I got lonely when they were away. So in October of 2009, I went on a hunger strike. That got their attention. They stopped running around so much and spent more nights at home with me. I suppose I should mention that I've always had a bit of a skin condition. The medical term is "eosinophilic granuloma," but it basically means my belly itched all the time. The humans used to worry because I would lick the fur off until I started bleeding, but it got much better after the vet prescribed THE MIRACLE DRUG--I think she called "cyclosporin" or something. Anyway. Fall of 2009. Hunger strike. Despite subsequent force-feedings of icky meat-pudding, some good things also happened: I got to play with curly ribbons and eat anything I wanted (the humans are obsessed with weighing cats--go figure), and I finally had my own pillow on the bed. Life was pretty good. I died on December 9, 2009. The humans were driving me to the vet for a check-up, and a few minutes before we got there, I felt weak and lay down in my carrier. I never got back up. I think I had a heart attack. It didn't hurt. The last thing I felt was one of the humans holding me and stroking my fur. She was making unhappy noises, and I wanted to tell her: It's okay. It's okay. I died in the car where I'd spent so much time the year before, traveling all over the country. I wasn't afraid. I was glad the humans were there. It was familiar. It felt like home. My name is Bayla, and for fifteen years, I was part of a family. I loved them, and they gave me a good life. The end. This blog is now located at http://roadtrip2008.malum-iter.com/. You can follow DeeAnn on Twitter as @DeeAnnSole. Her tweets may be infrequent, but always aim to be insightful. Well, we've reached the end of the year, and now that we've had our first guest stay over (Karin, right after Christmas), I guess we're officially moved into our new home. So we're closing down this road trip blog. You can continue to read occasional blog posts by Bayla, Jasper, and DeeAnn over at CKL's HotSheet. D has already posted about the snow which gave Portland its first "white Christmas" since 1937. I don't know what the cats will write about, but I'm sure it will be entertaining. Thanks for reading, everyone, and we hope to see you over at Snout.org. D and I spent some time earlier this month picking our favorite photos from the road trip (or, sometimes, the ones that would fit) and putting them into a photobook for our families. It took a long time, and the layout software left much to be desired, but it was fun to reminisce about all the places we'd been. We're pretty happy with the finshed product. You can flip through a tiny Flash version of the whole book over at mypublisher.com. If you tried to visit SNOUT.ORG today, you may have noticed that it was throttled for a few hours. That's because I exceeded the 300 MB/day bandwidth limit on my account. I suppose it was bound to happen sooner or later. I am told that one of the humans mentioned Bayla and me by name in this month's Stanford Magazine Class Notes. I believe this means that we are now FAMOUS!!!!!1!!!eleven! Welcome to all you Stanford Magazine readers! You really should have been reading this blog, like, six months ago, but it will still be quite exciting for you to go through the archives and see what we thought of places like the Grand Canyon or New Orleans or Niagara Falls. We're in a maxi-house now.